From 1957 The Diamonds released their million selling hit, “Little Darlin”. From then, they have received 3 gold records, 33 appearances on American Bandstand, the Vocal Group Hall of Fame, and Doo-Wop Hall of Fame. The Diamonds are now showcasing their brand new show, Jukebox Broadway. 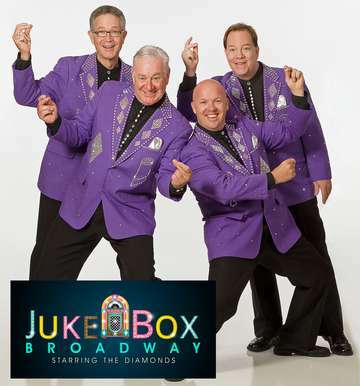 The Diamonds will perform 25 songs from 15 of Broadways most popular jukebox musicals such as: “Come Fly With Me”, “Smokey Joe’s Café”, “Beautiful”, “All Shook Up”, and “Jersey Boys” to name a few. Drop your dime in the Jukebox and make your selection because Jukebox Broadway is a musical treat for all .